Many people have posited their thoughts on the recent business decisions at Hewlett-Packard. In fact, I think one of the more compelling pieces I’ve read was penned by follow ZDNet contributor Larry Dignan. His piece is one I highly recommend that others read. I’m not going to rehash others remarks about HP’s recent decision regarding its Touchpad tablets or its exiting of the PC business. However, I would like to discuss the potential strategies that had to been covered by Leo Apotheker (HP CEO), the HP board and possibly others within the firm. General Electric’s former CEO Jack Welch is said to believe that any operating unit within GE needed to be in the top one or two market share positions in its sector. The theory behind this strategy is that only the largest players in a segment can achieve economies of scale in component purchases, sales/marketing efforts, distribution/logistics costs, etc. Furthermore, a market leader is often invited into many more deals simply because of its perceived safety, longevity and market success. Hewlett-Packard’s Personal Systems Group, the makers of its personal computing products, is by many estimates the largest personal computing manufacturer in the world. This group sells products under both the Hewlett-Packard and Compaq brands. I have been a many time consumer of these products. So why would Hewlett-Packard want to sell or spinoff such an asset when it has the market share/market leadership that it does? The answer lies with an emerging reality regarding computing devices. Decades ago the only computers were huge mainframes (room-sized). In subsequent decades, we saw the introduction of smaller departmental or mini-computers (refrigerator sized). The size of computers shrank markedly when the era of the personal computer came of age in the early 1980s. Within a short time, Compaq, Kaypro and others introduced luggable personal computers (sewing machine sized). Over time, 18-pound luggables continued to shrink in size and weight to more closely resemble the laptops of today. But even laptops have had to give ground to netbooks. And netbooks have had to cede market share to tablet computers. And as the size of these devices continue to shrink, the power and storage capacity within each continue to grow. Tablet computers and smart phones are now the new preferred computing platform and are displacing desktop and laptop computers by the score. We even have a new generation of worker who embraces BYOT (bring your own technology) or BYOD (bring your own device) to work. These workers do not want their grandfather’s desktop computer at work. They don’t want an 8 pound notebook with its 1 pound power transformer. They don’t even want the company supplied Blackberry cell phone. They want to bring their own iPhone, iPad or other device to their new job and they expect the IT department to find a way to serve up corporate data on their device. In other words, Hewlett-Packard’s Personal Systems Group is number one in a market space that may be in decline. Worse, it may be in permanent decline. The decision to spin off or sell this asset of the company is quite logical if Hewlett-Packard can receive a solid price for the business. But selling it off also gives the company the focus it may need to zero in on higher growth markets. That said, the discontinuation of the HP Touchpad tablet computer would seem to be in contrast with the last strategy (i.e., focus on growth markets). Tablet computers are hot commodities today and Hewlett-Packard appears to be walking away from this space. That makes me believe that other strategies were being considered or are being employed regarding the tablet business at Hewlett-Packard. My suspicion is that Hewlett-Packard leadership realized that it was a couple of years late in entering the tablet market. It did not have first mover advantage. It probably didn’t have second mover advantage either. HP’s presence in the tablet market was that of a follower or fast follower. In the world of consumer-based electronics, leadership is often everything while followers are often relegated to the lowest possible margins, high setup costs and high sales and distribution costs. In other words, followers get the low margin space – HP is not a low margin player. Unless Hewlett-Packard believed it could quickly out innovate its way in the tablet space, its newest products were simply too little, too late. While painful, discontinuing this product line may have saved the company from years of disappointing sales and little market share gains. Behind both major decisions of Hewlett-Packard’s, one cannot escape the importance of speed of innovation. And this may be the most important strategic discussion Hewlett-Packard leadership must undertake. Can Hewlett-Packard operate at the speed of business? If Hewlett-Packard is to be market relevant, it must find a way to move and innovate at the ever accelerating speed of business. Innovation, contrary to what many of us intuitively believe, rarely occurs at linear rates. It actually occurs at curvilinear rates as researchers like Ray Kurzweil have demonstrated time and time again. The implications of curvilinear change on any organization are significant as almost all companies I have known operate on a linear change fashion. But for successful technology companies, the rate of innovation must be ever accelerating. Failure to increase one’s speed of innovation is a prescription for corporate suicide. Much has been made of HP’s apparent moves in the software space. Yes, margins are often solid in the application software space but the best margins often go to vendors with significant product footprint, a captive maintenance base and many low-cost prospective customers that can be cross-sold additional products. Today, the application software market has some issues. First, many of the on-premise application software vendors are owned by Oracle, Infor or a couple of other players. Consolidation for on-premise products (and their lucrative maintenance monies) is pretty much a done deal. The next best frontier would be to either acquire the last big on-premise giant (SAP) or go for a portfolio of SaaS firms. The best strategic route may be the latter strategy as cloud solutions will likely rule before long. 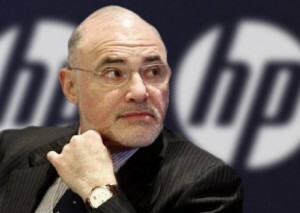 However, if shareholders are demanding short-term accretive results, the on-premise route might be where HP goes. I’m not sure that would be right. HP already has its foot in the door at many of the largest data centers globally. What HP needs is not more ways to get into the accounts it already has. What HP needs are clear alternatives and new, innovative solutions to present to its customers and prospects. The multi-tenant SaaS software products are those solutions. This should be an interesting case study to watch unfold. – Will HP successfully spinoff its PC business? – Can the dropping of the Tablet product line be done without additional brand damage? – Will HP increase the speed of innovation within the firm? – What will HP deliver next?